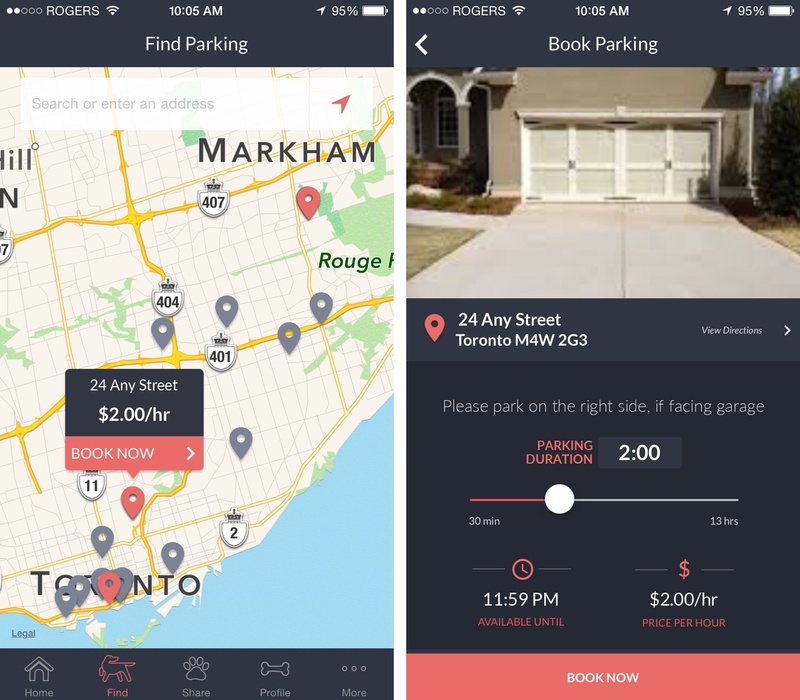 Rover Parking, an app developed by a Toronto-based developer that connects drivers with unused parking spaces, has become the latest app to earn the City of Toronto’s scorn. The app was released several weeks ago on iOS and has thus far found modest success after being downloaded more than 1,000 times from the iTunes App Store. But the app, like compatriot Uber, isn’t entirely legal according to the city’s bylaws. Like other apps that leverage the idea of the sharing economy, Rover Parking attempts to facilitate the better use of excess capacity. Once they’ve download the app, users input their credit card and vehicle information. They then search for available parking spots using a map of the city. Once they’ve found a spot that’s available, the user simply indicates how long they would like to park there and the app takes care of the rest. Anyone that’s renting out their parking space is only allowed to charge up to $2 per hour. This limit was implemented by the app’s developer in order to keep the price of parking spots on Rover consistent with what someone might pay to use a city-owned or private lot. “We’re just really looking for the help of the people who have spots and want to share them and want to make a few bucks, and make it easier for the people who are driving into Toronto,” said Tim Wootton, one of the co-founders of Rover Parking, to the Canadian Press. What might prove to become the app’s downfall is that its developers approached City Hall before the release of their app to negotiate a compromise. Like most city bylaws, Toronto’s parking rules weren’t written to account for apps like Rover. A homeowner can be fined up to $5,000 if they use their private parking lot like a commercial one. Rover tried to find a workaround for this limitation, but it seems like the city is unwilling to play ball. “It’s not legal. So I don’t think we could enter a discussion about it,” said Klaus Lehmann, a worker for the City of Toronto, when asked by Canadian Press reporter Michelle Mark to comment on the app. Despite the potential for conflict, Rover plans to expand to other Canadian cities later in the year. In the meantime, if you live in Toronto, check out the app for yourself by downloading it from the iTunes App Store.